The Millennium Prize Foundation today announced that Professor David Payne of the University of Southampton has been selected as a finalist for the 2008 Millennium Technology Prize, the world's largest and most prestigious award for technology innovation. Professor Payne, who is Director of the world-renowned Optoelectronics Research Centre (ORC) at the University of Southampton, is nominated along with two colleagues, Dr Randy Giles, Director of Optical Subsystems and Advanced Photonics at Alcatel-Lucent Bell Labs, and Professor Emmanuel Desurvire, formerly of Bell Labs, Columbia University, Alcatel and currently Director of the Physics Research Group at Thales Research and Technology. The scientists are being recognised for their historic contributions to telecommunications through their pioneering research developing the world's first practical optical amplifier - the Erbium-Doped Fibre Amplifier (EDFA) - and its use in fibre optic transmission systems. It is this crucial component which forms the backbone of the World Wide Web and has made possible an explosive growth in the internet through its ability to transmit and amplify vast amounts of data. The EDFA, developed in 1987, is widely regarded as one of the most significant developments in modern telecommunications. Optical fibre transmission systems were first deployed in the mid 1970s and soon afterwards a new technique, wavelength division multiplexing (WDM), promised to dramatically increase the fibre's data-handling capacity with the simultaneous transmission of multiple signal channels. To unlock the potential of WDM though, breakthrough technology was needed to overcome the inherent signal losses in optical fibre. It was the discovery that erbium, a rare-earth element, possesses unique properties ideally suited to the amplification of light signals in optical fibres that led to the invention of the EDFA for which this team is recognized. An international researcher who has spent his entire career spanning four decades with the University, Professor Payne has generated many influential discoveries in diverse areas of photonics, from telecommunications and optical sensors to nanophotonics and optical materials. His pioneering work in fibre fabrication in the 1970s resulted in many of the special fibres used today. He also led the teams that developed the single mode silica fibre laser and broke the kilowatt barrier for the output power of a fibre laser. 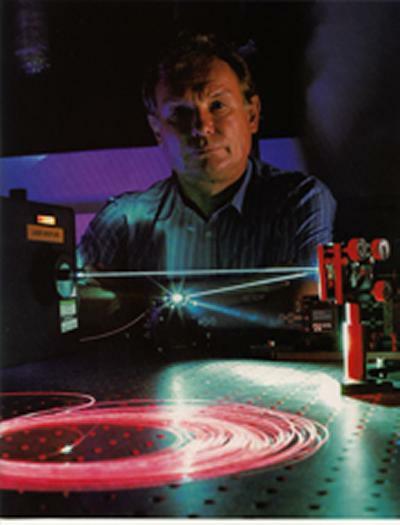 Some of the highest power fibre lasers in the world have been designed by Professor Payne and his team. As a leading University entrepreneur, Professor Payne's activities have led to a photonics cluster of nine companies surrounding the ORC, creating jobs and wealth in the Southampton region. With colleagues, he founded SPI Lasers plc, a leading supplier of high power fibre lasers located at Hedge End. In 2005 SPI Lasers successfully floated on the Alternative Investment Market. A total of 99 individuals were proposed for the Millennium Technology Prize by 88 organisations in 27 countries and, in addition to the Payne-Desurvire-Giles team, three other finalists were announced today. The winning individual or team will be announced at an award ceremony in Helsinki, Finland, on 11 June. The prize pool for the 2008 Millennium Technology Prize is € 1.15 million. The winner of the Millennium Technology Prize will be awarded € 800,000, and the other innovations will each be awarded € 115,000. Past winners of the Prize include Sir Tim Berners-Lee, inventor of the World Wide Web and Chair of Computer Science at the University of Southampton's School of Electronics and Computer Science, and Professor Shuji Nakamura, inventor of new revolutionary light sources. The Optoelectronics Research Centre at the University of Southampton is one of the largest university-based research groups entirely devoted to optoelectronics in the world, and has maintained a position at the forefront of photonics research for over four decades. Its long and well established track record in the fields of optical fibre, lasers, waveguides, devices and optoelectronic materials has fostered innovation, enterprise, cross-boundary and multi-disciplinary activities.